Everton Camp, at a height of 400 ft, is located approximately 1¼ south east of the village of Inverkip and covers roughly five acres. Everton became the Greenock District Camp Site in 1923 when the privilege to use the ground was granted by Sir Michael Hugh Shaw Stewart, who was keenly interested in Scouting. The site has been held during the pleasure of Sir Michael and his successors up to the present time with Lady Shaw Stewart. The use and purpose of the site, in terms of the Agreement, was and still is for a Training Camp for Scouts and Scout Leaders. The Agreement included the right to draw water from the stream. 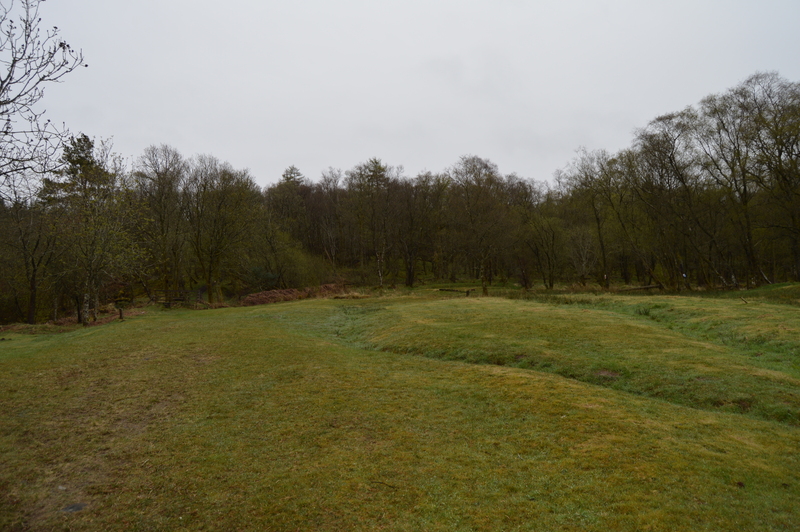 The Camp is located on the edge of the former Everton Quarry and it is very likely that many of the houses in Inverkip village are built of the stone quarried at Everton. The main hut was built in 1923 on top of a small hillock, commanding a view over the Parade Ground and Camp Entrance. Lanterns or torches were the means of providing light during the hours of darkness. Over the years, toilets and wash places were added. Improvements were made to the water supply by use of a dam at the southerly top of the Camp and piping the water through filters down into standpipes in the Camp. The swimming pool was built in the early 1930’s under a Government Grant system whereby material and transport was supplied free and the District supplied labour in the form of Scouters and Rover Scouts, many of whom were unemployed due to the depression at that time. In 1934, the Daily Record newspaper presented the Camp with a Mountain View Indicator. The Indicator was built near the Swimming Pool and enables the Argyllshire peaks to be identified. In 1969, an extension to the hut was built at a cost of £600 under the Capital Grant Scheme. Sir Guy Shaw Stewart agreed that we would have security of tenure for a further 20 years. At this time, the District Scouts had enjoyed an extremely privileged and trusted position for a period of around 50 years. It was the focal point for all outdoor activities. Many of the older generation, who were formerly Scouts, will have very fond memories of their experiences at Everton under the watchful eye of Camp Skipper’s such as Bertie Morrison and others. The Burn supplied an endless stream of cold water for washing dirty hands, faces and legs. Going to the ‘woods’, to find windblown trees. Using an axe to chop the timber into small and big pieces. Thus providing a selection of fuel for the cooking fires. The smell of wood smoke was everywhere especially at the Saturday night Campfires when each Troop was tasked with supplying wood for the grand bonfire. The sound of ‘Campfire’s Burning’ rang round the Camp. Sadly, the end of the old Everton hut came to an abrupt end in September 1992 when the hut was vandalised and the building was destroyed by fire. This was the end of an era but also the start of a new future. Plans were immediately drawn up to make good the devastation and build a modern replacement at an estimated cost of £50,000. The plans made provision for a modern building with staff headquarters, indoor accommodation for Scouts, kitchen and proper washing/toilet facilities together with wheelchair access. Electricity and running water was to arrive at Everton. What a gigantic leap into the next Century. In September 2001, the new accommodation was officially opened. With the assistance of many sponsors a magnificent facility than can be used by all the community was created. The main Sponsor, National Semiconductor, gave £21,000 from it’s charitable trust. To make maximum use of the available site, the original hillock was reduced to ground level and the new structure was built to the left hand side. This new building has proved to be invaluable to modern day Scouting. It allows a much greater all the year round use of Everton. The indoor accommodation enables a programme of events during all seasons. A new generation of Scouts now make use of a campsite with first class facilities in an area that allows outdoor activities to be appreciated. The names Ernie Salmon and Bertie Morrison bring back memories from a long time ago. I can even now feel the itch of the midges especially once while taking a Scout’s Own at Everton, with midges crawling up my kilt and me trying not to scratch. Happy days. I am doing some research on historic mountain indicators (discs or plates which show which hills are visible from a particular point). One of the most comprehensive lists of of indicators which was produced in the 1930s appears in B.H. Humble’s book Wayfaring Around Scotland (1936). I am trying to find out where this indicator stood and what has become of it and wondered if you had any information, or could direct me to someone who might? I know that there is what looks like the remains of an indicator where the viewpoint symbol is on the map (i.e. at the car park on the main road). But this does not seem to match Humble’s description. For one thing, the height of that indicator is wrong; but also it could not be described as being on the summit of a hill. Any information you could give me about this would be most welcome. The reason I asked this question is I noticed on the Greenock and District Scouts page there was a reference to the Inkerkip indicator which was also designed by Paterson and sponsored by the Daily Record.